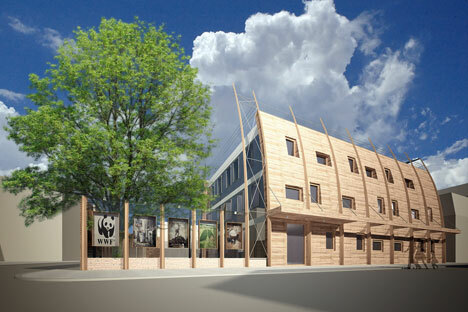 The Russian branch of the WWF is bringing sustainable, environmentally friendly construction to the center of Moscow. Could it be the start of a trend? The need to build eco-houses in Russia is nothing new. The technological feasibility of sustainable construction geared toward Siberian conditions was being considered as early as 2000, but the research was never put to any use. Although experimental houses with systems for solar heating and rainwater collecting already exist in Siberia and in the region around Moscow, their presence has largely passed unnoticed. It is only now that the issue has finally caught the attention of one of the biggest environmental organisations, the WWF. The charity is looking to convert its old headquarters in central Moscow into a “Green Office.” The building will use eco-friendly materials to make it comfortable, and, more importantly, the latest technology will be put in place so that the energy for heating and lighting the building will come from the sun, and the water supply will be fed by rainwater. This project aims to promote a holistic relationship between man and nature. A grass roof will provide insulation and soundproofing and help collect rainwater. A skylight inside the building will make maximum use of sunlight, and its insulation and energy-saving windows will prevent energy being lost. Solar collectors will heat the accumulated rainwater, and there will be a geothermal circuit, located four meters underground, to ensure that the building stays cool in summer and warm in winter; in winter the earth at this depth is five degrees warmer than the air temperature outside, and in the summer it is five degrees cooler. The permeable surfacing of the parking spaces allows the rainwater to seep into the ground so it doesn’t pool on the surface and turn into mud. One of the fundamental ideas of the eco-house is to decrease water usage not only through collecting rainwater, but also by filtering and recycling gray wastewater. Thanks to its new “green office” the WWF hopes to use a quarter of the heat energy and half as much water as other similar offices. According to the preliminary estimates by the project’s sponsors, the eco-house will cost at least two million euros. The architectural and engineering plan for the building was developed by VLI Vostok and the architect Patrick Le Priol in accordance with an energy agreement between Russia and France. When I heard the list of partners involved in the project, I could not help but notice that they were all foreign companies. The general director of Lafarge Cement, Alex de Valuhoff, explained that most of the materials are nevertheless produced in branches of the companies’ Russian-based branches (for example the Lafarge Cement factory is located in the Moscow suburb of Voskresensk), but unfortunately it seems that no Russian technological know-how is being used in the construction of the eco-house. We can only hope that this innovative building in the center of Moscow will capture the imagination of other people and organizations, and, perhaps, it will be the pioneer that finally kick-starts sustainable construction in Russia.